An unusual ice formation has appeared in the Presumpscot River in Westbrook. It’s a giant, spinning ice disk about 100 yards across and moving counterclockwise. The disk looks rather alien, but it’s actually a natural occurrence. Ice disks have been recorded in Scandinavia and in North America. Maine Things Considered Host Nora Flaherty interviewed Paul Nakroshis, an associate professor of physics at the University of Southern Maine, who says how they form and why is a bit of a mystery. Nakroshis: Well actually when I was called about this I immediately started to do some research. And there was a paper published in 2016 in a pretty well-known journal, Physical Review E, in which the researchers created a small ice disk in the laboratory and found that it rotated. But in the preface to their paper they say that the creation of these disks is actually not well understood. It’s probably formed — and this is speculation — by the aggregation of small little bits of ice or in an initial big chunk of ice that, because of initial rotation, little pieces of ice glob onto it. The mysterious ice disk in the Presumpscot River in Westbrook. Flaherty: And what are the conditions that I guess Westbrook is satisfying right now under which something like this would form? Well again the formation of these disks is not actually well understood. The paper that I referenced talks about the cause of the rotation being the ice melting underneath the disk, and as it melts the water sinks downward and causes a vortex that causes the disk to rotate. However, based on my reading of the paper, the water in the Westbrook river is not actually warm enough to cause the effect that the paper talks about. So most likely the cause of the rotation is just the river water going by the disk and once it starts rotating in that direction it’s probably going to continue. Do you know how fast this is rotating? So actually in 1895 in Scientific American there was a letter to the editor about an ice disk in a New York river. And it rotated at about one degree per second. It’ll go 60 degrees in a minute, and it’ll do a whole rotation in about six minutes. *When you see something like this, it’s kind of like, ‘Oh it’s neat. It’s interesting.’ Is there anything significant about a phenomenon like this or is it just kind of cool? Well it’s always interesting, I think, to see interesting natural phenomena that seem unusual, and learning about what the physics is that describes that only adds to the interest I think, and there are a lot of interesting questions that one could pursue. In fact, in the little reading that I’ve done about this, I’m left with more questions than answers, and to me that’s what makes science interesting. In order to answer scientific questions we would have to do some measurements about that disk rotating in Westbrook. For instance, it would be interesting to know, what is the topography underneath the river where that disk is? What’s the temperature of the water there? Are there any special currents in that particular location? All of these are interesting questions that contribute to understanding why that particular disk formed and rotates in the way it does. Is there anything sort of dangerous a downside about something like this? I can’t think of one off the top of my head, unless you happen to wander onto the disk and fell through. Originally published 4:15 p.m. Jan. 15, 2018. WESTBROOK, Maine - Maine's giant spinning ice disk that quickly gained international fame seems to have met its end. WESTBROOK, Maine - Think of it as a crop circle, but in a river. 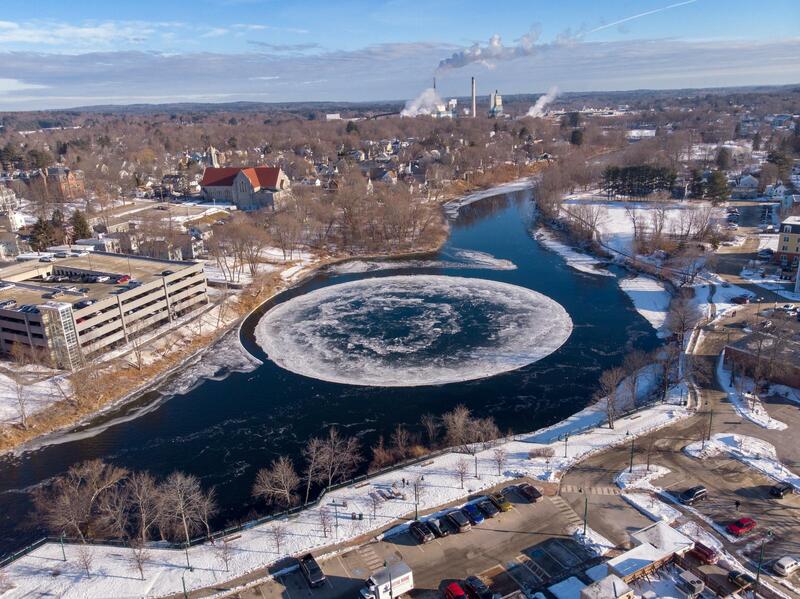 A curious formation that has grabbed the attention of Greater Portland, Maine, is actually a spinning ice disk, and it's roughly 100 yards wide.